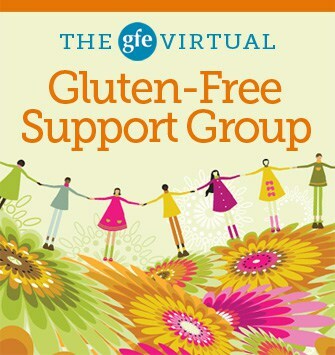 GFE Gluten-Free Virtual Support Group with Sunny Busby of And Love It, Too! It’s been a good while since I last shared a GFE Virtual Gluten-Free Support Group (VSG) post. If you’re new to gfe, these are the posts where I recap one of the meetings of the actual gluten-free support group I lead here in Virginia—as a “virtual” support group meeting. Do you remember my post from the July Self-Care Retreat on Saying No with Unexpected Wonderful Results? I talked about how I’d decided to take a break from being the one to host all of the meetings of my gluten-free support group and how several members of my group had graciously stepped up to the plate. Well, I took the same sort of hiatus from my VSG. It’s been a great break, but I’m ready to share some of the wonderful meetings and presentations that we have enjoyed the last several months. I’m starting with Sunny Busby’s, the author of And Love It, Too!, presentation to my group and I’m also making a few changes to my VSG format. I will continue to share the food, the presentation, and the giveaway, but I’m no longer going to commit to hosting a linky within the VSG post each time. I might include one from time to time when we have a special food theme for my “real” support group meeting but, otherwise, I’ll leave the linky part to all the expert bloggers who do gluten-free linkys each week (like my friend, Linda of The Gluten-Free Homemaker, who hosts Gluten-Free Wednesdays). The food at our gluten-free support group meetings is always the very best! 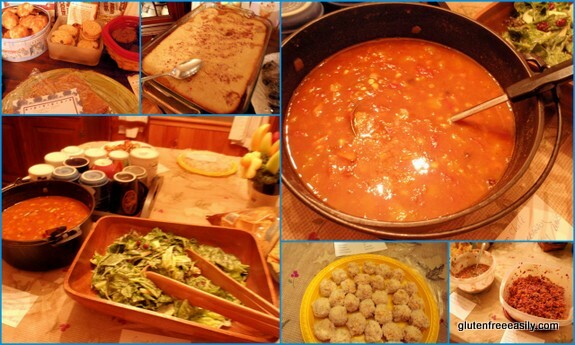 Our meetings are potluck events and as I said, we sometimes have food themes, sometimes not. Not having one allows members to make dishes based on local seasonal ingredients and many of them have their own vegetable gardens, grow their own herbs, etc. All of these folks really do use the gfe approach. That means they focus on real food/whole foods and recipes made from them first and foremost, then mainstream foods that are gluten free and, finally, a few gluten-free specialty items. You can really see that by looking at our “spread” below. The Food: Kathi’s Great Salad; Carrot and Red Cabbage Salad; Sweet Potato Chili; Green Garden Salsa and Tortilla Chips; Chicken Curry Balls; Grilled Pizza Chicken; Brownies; Peach Cobbler; Perfect Pound Cake (made by one member as a birthday cake for her husband—see photos); Deanna’s Snickerdoodles; Pumpkin Bars; Assorted Complimentary Treats from Lucy’s Cookies (e.g., Brownie Snacks, Chocolate Chip Cookies); and an Edible Arrangement (also for the birthday celebration; read Edible Arrangements FAQ). 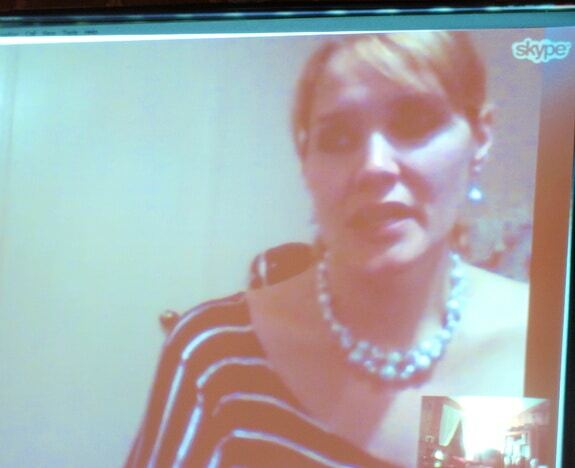 Sunny Busby, the very sweet genius behind the blog And Love It, Too!, was our guest speaker via Skype. Sunny hosted the Healthy Lunchbox series on her blog for two years, so having her speak to my group at the beginning of the school year seemed ideal. But, healthy lunchboxes are always needed and even if we gathered great ideas at the start of the semester, right about now we’re in need of some new inspiration. In fact, National School Lunch Week was just held recently. 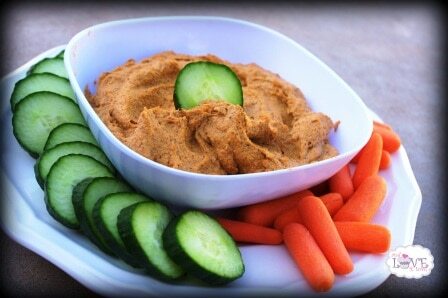 We all know that it can be really easy to get into a rut with lunches and when busy even to skip them. Having a Healthy Lunchboxes approach can help you avoid doing both. Per my request, Sunny first told us about the meaning of her blog’s name. 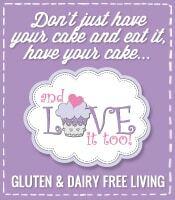 Her motto is: “Don’t just have your cake and eat it, have your cake and love it, too.” Simply put, she wanted gluten-free cake, dairy-free cake (and any other food/recipe) to taste great enough for you to not just “have it,” but for you to love it, too! She talks about the meaning of her blog’s name and her overall philosophy in her “three-year blogiversary” post. There truly is no deprivation with Sunny’s gluten-free, dairy-free (and “more free”) creations. Sunny’s well known for re-creating old favorites (and always welcomes reader requests for those). Her re-creations also include knockoff recipes for the key components of so many recipes. For example, I have featured several of her terrific recipes on my All Gluten-Free Desserts … All the Time site. She created gluten-free, dairy-free, refined sugar free, and vegan Sweetened Condensed Milk so she could replicate a “safe” version of her Chocolate Pecan “Toll House” Pie. Both recipes are hits on All Gluten-Free Desserts! I always ask our speakers who are gluten free to tell their personal stories—at least in way of introduction if it’s not the focus of their presentation. I am convinced that personal stories lead individuals to diagnosis and/or going gluten free more than any other single method. Sunny shared that she had once weighed 300 pounds, but in a matter of months she was down to 115 pounds. Like many of those who go gluten free, her journey to health took a number of twists and turns. She was first diagnosed with Polycystic Ovarian Syndrome (PCOS) in 1999 and with celiac disease 10 years late, in 2009. Sunny pointed out that PCOS has only been defined as an autoimmune condition within the last 5 years. She said that had she known that PCOS was an autoimmune condition, she would have started much earlier in her quest for health and wellness. Sunny also has had symptoms of Hashimoto’s disease, an autoimmune thyroid condition. Sunny’s daughter had been diagnosed at 17 months old with a severe dairy allergy. This diagnosis led Sunny to “engulf” herself in all things nutrition education and learned the “power of food,” both to harm and heal. Therefore, she was able to recognize when her youngest who was still nursing was having negative reactions to the foods that she herself was eating. When Sunny’s own chronic illness was becoming overwhelming, she decided to go on an elimination diet, and with clear indications that she reacted adversely to gluten (and more), she pushed to be tested for celiac. Sunny shared that she was gluten free first; then gluten free and then dairy free; then gluten free, dairy free, grain free, and refined sugar free; then paleo; and was (at the time of the support group) following the autoimmune paleo protocol (AIP) (to determine any other possible food sensitivities). She explained that the AIP adds nightshades, eggs, nuts, and seeds (optimal) to the list of foods to be eliminated, in addition to what the traditional paleo diet eliminates—grains, dairy, sugar, and legumes. Sunny’s weight is getting close to her ideal and she’s feeling great these days. She looks fantastic, too, although admittedly the Skype screenshot I’v shared does not do her justice. Sunny told us that her husband has been eating the paleo way as well. He’s lost weight and has much more energy. At one point, he decided to re-introduce dairy in his diet and quickly determined that his body could not handle it. Sunny and her husband have five children—both biological and adopted—two 14-year old sons, a 12-year old daughter, a 9-year old daughter, and a 7-year old daughter. Sunny’s life is full of children as she’s also a teacher by trade. At the time she spoke to my group, she taught 380 students each day. Sunny is also the originator of the fabulous Healthy Lunchboxes series, which was one of the reasons I invited her to speak to my support group as the school year began. Observing children’s lunches daily, she saw the need for healthy lunchboxes and she was looking to both give inspiration to and get inspiration from her readers. Sunny told us about the daily lunch of one of her students—a Dr. Pepper with a Pop Tart. She never saw him eat either fruit or vegetables. He was overweight and had learning difficulties. She would have liked to have been able to “help” in some way but, as Sunny stated, she couldn’t advise him or his parents in her position as his teacher. Healthy Lunchboxes from And Love It, Too! Sunny’s and her husband’s success were certainly exciting to hear about it, but it was probably her one son’s—her oldest child—health changes that surprised our group the most. He had been diagnosed with ADD and had severe vision issues and his vision issues kept getting worse. At age 11, he was diagnosed with borderline glaucoma, and then later he tested positive for glaucoma. There was no history of glaucoma in her family. With the help of her optometrist and her son’s psychiatrist, Sunny discovered something very interesting. All kids with ADD and ADHD who are on medications have some added pressure to the eyes. It was this added pressure that was creating such an issue with her son’s vision and his prescription glasses were getting stronger and stronger. She wanted to get him off medications and stop the damage to his eyes, so she knew it was time to pursue dietary changes for him. As Sunny and her daughter were both on a gluten-free, casein-free diet and had both seen great success, she suggested to her doctor that her son should go on the same diet to treat his glaucoma. His doctor’s response was: “It will never work.” Oh, but it did. Sunny put her son on a gluten-free, casein-free diet and after only 18 months, he no longer tested as a definite positive for glaucoma, he only tested “borderline” for glaucoma and his prescription actually improved. He was still considered “at risk” for the glaucoma at the time, but was no longer on any prescription medications and was doing well (getting As and Bs) in school. With a subsequent diagnosis of candida, Sunny and her middle daughter’s journeys to good health have continued on. You can read more here and stay tuned to Sunny’s blog for future updates. Here Sunny gives even more info on candida on this resource page on her site. Sunny reminded us of the old, but good advice, to Keep It Simple, Silly. As she said, “a balanced meal of protein, whole fruits and vegetables doesn’t have to be complicated.” As an example, she shared one of her favorites lunches: hard-boiled eggs, blueberries, grape tomatoes, carrots and celery slices paired with a side of Roasted Red Pepper Paleo Hummus. Sunny likes to use the mayo recipe from Melissa Joulwan’s Well Fed cookbook, both of which are favorites of mine as well! She also relies on her dehydrator for making healthy dried fruit and beef jerky. For great sources of real food, Sunny cited CSAs, local farmer’s markets, and Bountiful Baskets. The latter is a volunteer-based organization, which is always looking to expand. (Note that there are many states and areas it is not available in yet.) The quality is great and the cost savings is significant. She told us that she spends about $60 to $100 for $200 to $300 worth of produce through Bountiful Baskets. The savings can vary according to the individual items in the basket, but she said the savings are always very worthwhile. One of her favorite produce items is Hubbard squash. Huge in size, but sweet like other squashes, such as pumpkin, she says that these squash are a great value because they are pretty inexpensive from the start and they offer two to three more times the meat/flesh of a regular pumpkin. She’s been known to get exceptional bargains on Hubbard squash at her farmer’s market. For ready-made gluten-free (not paleo) bread products, Sunny highly recommended Local Oven, which is based in Dallas, and offers their products for sale in a number of grocery stores, restaurants, and online. (You can see if there’s a location near you here.) Most of Local Oven’s products are dairy free as well. Sunny told us that their products are not only excellent, but also reasonably priced. Sunny’s family’s grocery bill is around $1000 a month, but for a family of seven that works out to be less than $1.50 per meal. And that’s for meals that focus on grass-fed meats and organic fruits and vegetables. Sunny emphasized that “treats are okay!” She lets her kids take treats at least once a week. She admitted that her treats are much healthier than what many might consider to be treats though. The vanilla cupcakes—a well-known staple for school treats and parties—that she sends to school with her kids are not your usual sweet treat by any means; they’re actually Yellow Squash Vanilla Cupcakes. 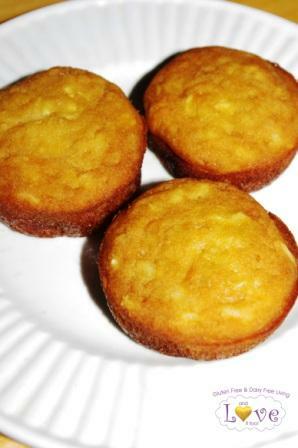 Vanilla Cupcakes (Yellow Squash) from Sunny Busby of And Love It, Too! Sunny shared another recipe with my group that she had not yet published on her blog at the time of our meeting, her new grain-free, nut-free, sugar-free, and nightshade-free granola. Now you can find her recipe for Paleo/Autoimmune Granola here. Like Sunny told us, one would never guess that any of her goodies are no sugar (or low sugar), high in protein, and packed with nutrition. Those are the best options for healthy lunchboxes for sure! Paleo Autoimmune Protocol (AIP) Granola from And Love It Too! Read more of Sunny’s thoughts on a healthy lunchbox in her kickoff to the latest Healthy Lunchbox series and see all 31 contributions to the series in the final roundup, Healthy Lunchbox The Ultimate Collection. 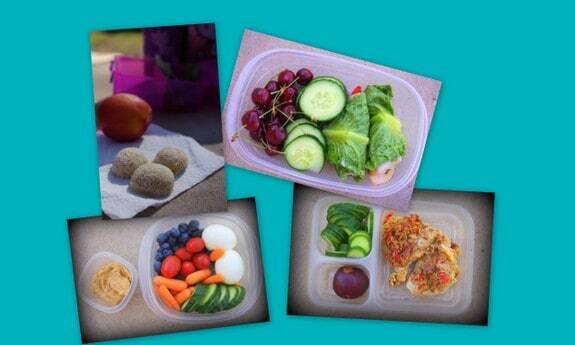 She summarized her previous series and shared all the posts in this Healthy Lunchbox Roundup. Incidentally, I was happy to participate in all of Sunny’s Healthy Lunchbox events to date, sharing “The Cagey Old Bachelor” Philosophy … A Tapas Approach to School Lunches” in the first series and more tips (you won’t want to miss the apple rubber band trick) and a recipe for Chocolate Nut Butter Oat Cookies in the second series. Many, many thanks to Sunny for being willing to share her family’s story, her terrific Healthy Lunchboxes, and her overall excellent presentation! UPDATE: This giveaway is now closed. Winners are shown below and will be contacted via email. As always our giveaway is a mix of items related to food from the actual meeting and/or the presentation. 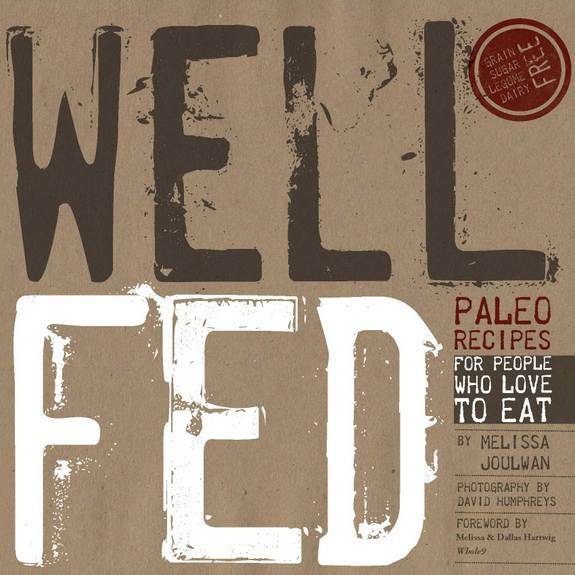 ~ Well Fed: Paleo Recipes for People Who Love to Eat by Melissa Joulwan (who blogs at The Clothes Make the Girl)—I purchased this book for myself when it first came out. It’s terrific! It has 4 ½ star ratings on both Amazon and Goodreads and on each has over 700 reviews! Just so you know, the less positive reviews come from folks who don’t like Melissa’s love of spices (cumin is her favorite and it’s mine, too! ), others who point out issues with the book binding (many early copies had physical quality issues, but those have been resolved), and another group of folks who think she’s too snarky. However, I like her honest and entertaining writing and appreciate her telling her personal story, which includes a family life that centered around food and a thyroidectomy before learning about the value of food in her own health journey. ~ Lunchboxes: Sistema Klip It Lunch Food Storage Cubes—Made in New Zealand from BPA-free virgin polypropylene, these lunch containers are very popular. Many of my blogging friends recommend them! Each lunchbox separates into two sides. Side 1 is partitioned into two sections and is great for smaller food items and snacks. Side 2 will hold something larger like a sandwich or wrap. These lunchboxes are also dishwasher safe, microwave safe, freezer safe, and airtight (but not liquid tight). If you’re interest in all of these prizes, please leave a single comment where you talk about all of the ones you would like to win. This giveaway ends Friday, November 8, at midnight Eastern. Winners will be contacted via email and will have 24 hours to respond. If there is no response, a new winner will be chosen. GFE VSG Disclaimer: Please understand that I, and others whose advice is cited here, have no expertise when it comes to your personal medical issues. Some who are quoted here do serve as medical professionals, but they have no knowledge of your specific medical needs and situation. Please consult your own health care professionals for medical guidance as needed. This post is linked to Gluten-Free Tuesdays, Allergy-Free Wednesday, Gluten-Free Wednesdays, and Gluten-Free Fridays. Thank you for all the awesome info! I would like to win any of the prizes – Lucy’s cookies are great – I particularly love the Maple Bliss! The Well Fed cookbook sounds great – I do prefer my cookbooks in hardcover. We just finished a box of Lucy’s Cinnamon Thins & loved them. Would love to try the chocolate ones next. Thanks for the virtual support group sharing, Shirley. I am always amazed how much food plays a part in our health. The story Sunny shared about her son’s vision was amazing. So happy to read he is doing well. I can’t pick a favorite Lucy’s – sadly for my waistline – they are all awesome! I have been trying to cook Paleo once or twice a week so the hardcover version would be wonderful. Lastly, I pack my lunch everyday during the work week so the storage cube would be handy and cut down on my baggie use (even though I do reuse them – I’m a penny pincher (: ). Thanks for the giveaways! I think this story is one of the best healing stories I’ve read! How wonderful that Sunny’s son no longer tests positive for glaucoma – I’m always fascinated to read how changes in diet can have such positive outcomes! It must have been such a very interesting presentation. I would like to be entered for the cookbook Well Fed. I’ve recently seen it on Amazon and added it to my ever growing wish list. Many of the recipes look suitable for our diet and it looks so interesting and easy to read! I don’t own a kindle and would prefer the hard cover should I be so lucky to win. Thank you for sharing the story of your & your family’s journey toward health. I sent a link to this page to each of my friends who struggle with gluten sensitivities or other food allergies. Hooray for your son! 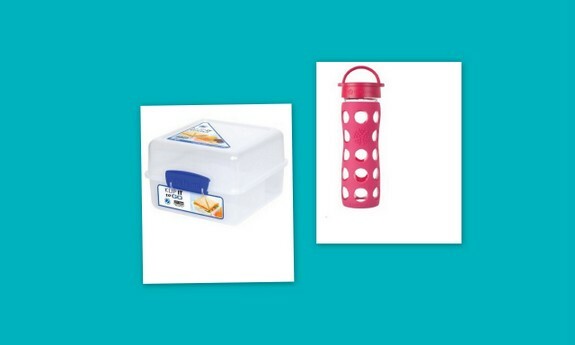 Please enter me to win a food storage cube. I own the Well Fed cookbook and refer to it often. Whenever I fly I make sure to bring a bag of Lucy’s cookies with me so I never have to feel deprived when everyone else is snacking away. Thank you for sharing this story How amazing that Sunny’s son’s diagnosis of glaucoma was aided by dietary changes. I had never heard of this. I would like a copy of Well Fed. I’ve heard good things about it and would love to own the Kindle version. Thank you for your informative information and the opportunity to win a prize. I would love to win a hardcover copy of “Well Fed”. I am particularly interested in the olive oil mayo recipe you mentioned; I’ve been looking for a gluten free mayo recipe for a long time, but due to various allergies, the few I’ve found always have ingredient(s) that prevent me from using them. The book will be very helpful in helping me to go paleo. I also enjoy the Maple Bliss and Chocolate cookies, and would like to try the Ginger Snap cookies. PB&Banana on “multigrain” gf bread with a side of carrots and ranch! Thank you for sharing Sunny’s story! I love it when someone else finds out food is healing! We love Lucy’s cookies! as we have multiple allergies/sensitivities, we don’t have many things everyone can have.. Lucy’s is one of the few! We love the oatmeal the best! I would also be interested in entering the contest for the lunchbox. My 5 year old requested sauteed zucchini and red peppers for lunch tomorrow. Along with some chicken and dried cranberries for a treat.. it’s one of her favorites! I would love to win a storage cube or the chocolate or sugar Lucy’s cookies. Yum!! I love Lucy’s cookies. I am a sugar cookie fan. I love cookbooks and have been trying to incorporate more Paleo type recipes into our diet. I would prefer the hardcover. Great post! It’s always fun to drop in on your gluten-free support groups. I just wish I didn’t have to lurk from afar! I’d love to be there in real time. No need to enter me in the contest, but I did want to say that my kids (4) brought their lunches every day of the school year. I love all these great ideas! My daughter (Tevis) brought almost the same thing every day. A rice cake (because those didn’t make her sick — ugh, wish we had known then, what we know now) with peanut butter and bananas, some carrot sticks, celery, cucumber (something like that), a small carton of yogurt, and maybe a homemade granola bar. She always brought water. She graduated from high school in 1998 and I don’t think she ever bought her lunch. I ate a big lunch, but this post is still making me hungry! I love Sunny’s motto. Yay Shirley & Sunny! You guys make a great team! I’d love to win these prizes. Constantly looking for more help with our new gluten free dairy free lifestyle. Thank you so much for everything you do to help others. Have never tried Lucy’s cookies, but would love to..Newly gluten free due to Hashimoto’s disease.Would love a hard copy of the cookbook! This is a great giveaway! I love all of these prizes. 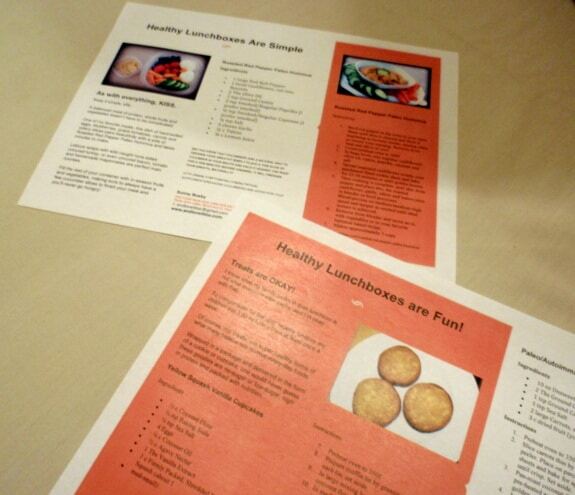 I could use that cookbook to try some new recipes and my daughter could use the healthy lunch box. Thanks for this giveaway! I’ve seen the well fed cookbook and it’s awesome, I’d also love cookies! I would love to win the Lucy’s cookies. The ginger snaps are delicious, but they’re way too pricey for my wallet! Or, I’d settle for the cookbook; one can’t have too many cookbooks, IMHO! The lunchbox would be great to win to send my husband’s lunches to work with him. He’s got a dreadful new job (although in this climate ANY job’s a good thing), and it would be nice to have it all contained instead of a several containers in his lunchbox! I have been gluten free for about a year for health reasons. Interested in going Paleo and taking the family with me 8) The Well Fed book would be so helpful and I love Lucy’s cookies but have a hard time finding them. The lunchbox is very cool. I think it’d be a great gift for my daughter or son to start them on their Paleo journey. I love your blog. Thank you for all the recipes and info. Pick me. Pick me. Would like the lunch tote to secure my lunch, the kindle version of well fed & either chocolate or cinnamon cookies. Thank you! I would love to win the hard copy cookbook. We are just starting to try to eat more Paleo meals, my daughter and I have celiac and my husband is diabetic. Thanks for all the information that you supply on a regular basis. I’ve tried quite a few of the recipes since we’ve gone gluten free due to my youngest son’s diagnosis of Celiac. I would love to try the cookbook as I don’t have any but the traditional cookbooks that all use wheat flours and such in the recipes. I’m not confident enough to try to switch things up yet. I also wouldn’t mind a sample of the cookies. I am currently struggling with what to send to school for the little guy’s safe treats for when there are birthdays. He’s already been left out of one birthday treat day and I felt so bad for him. 🙁 Having some decent cookies to send along would be lovely. I don’t think those cookies are even available around here. Cinnamon or Chocolate would probably be a big hit here. Thanks again for being a small island of calm in the craziness. I was very overwhelmed and still occasionally struggle with feeding my family of 5 meals that they aren’t going to turn their noses up at. Would love to win the cookbook Well Fed or the lunch box. Between dairy allergies and the awful quality of school lunches, he much prefers his own lunch! My daughter loves to take baby carrots and dip in her lunch. That divided box would work beautifully! Hi Shirley! I would love to win a copy of Well Fed in hardcover! I have been Paleo since 1999. New recipes are always appreciated! I would love to win the cookies or well fed lunch boxes. I find that I eat too many of the same foods over and over again since I have been gf. It would be nice to have more variety. have I mentioned, lately, how much I appreciate all the you do for the gf community? because I do. I would love a hard cover copy of well fed. I have a kindle version but I’d like one that I could lend out to others. I want to win them all!!! All sounds great. I prefer hardback book. Thanks! Fascinating story about the improvement of her son’s glaucoma! Once again it demonstrates there is *nothing* in our bodies not affected by the food we eat. Thank you for all of the great information. I would love to have any of the items. My daughter has celiac, so she takes her lunch to school everyday. We love the Lucy cookies. I am always looking for new foods to eat. I’ve tried Lucy’s Cinnamon Thin Cookies and they were amazing! I have never tried any of the others but would love to! I have been gluten free for almost 2 years…I would love a hard copy of the book to expand my families food options. We have 4 picky kids under the age of 9! I love Lucy’s cookies, the oatmeal ones are my favorite! One day I will make it to one of your support group meetings I live in northern VA). We love apples in the lunch! thanks! These are for Mom! Judy she loves them dearly 6-10 boxes a month! And they are helping to heal her brain by eating no gluten! She loves cinnamon sugar, maple bliss, sugar, chocolate, chocolate chip and I love the ginger! Shirley I would love to win for myself the Well Fed cookbook. As I continue on my Paleo journey feeling better all the time I spend hours learning more and more things to cook as food has always been my family’s thing so the more I learn the more “well fed” in a healthy and sustainable way the happier more productive people we get to be! Thanks for listening! I would love the Lucy’s cookies. Sounds like a lot of people enjoy them! I love, love, love Lucy’s cookies. The ginger flavor would be perfect his time of year. I would love the well-fed. Our family has taken on the paleo lifestyle to hopefully help with an unspecified autoimmune issue in our teen daughter. I need more ideas on what to prepare and more variety. I would love to win the Well Fed cookbook because I want to do more to make myself and family healthier. Well Fed unless the Lucy’s cookies are grain free, then I will take them. Thanks for the giveaway! Think its all awesome. Would love any of it!!! i’ve heard that there are some good recipes in well fed, and i’m always looking for more ideas on paleo meals! I’d prefer hard copy but could also use the ebook just fine! I love your blog and refer to it daily! 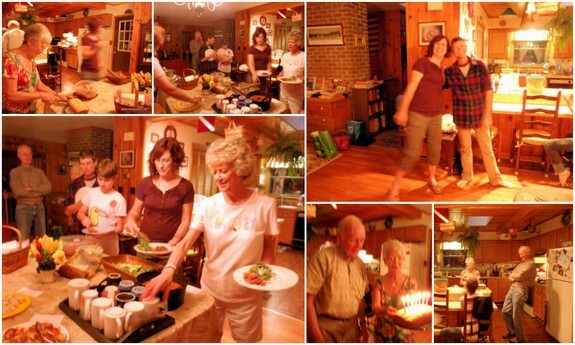 I love cookbooks and finding new recipes the meet all of my family’s needs and preferences. I am gearing up to do a “food challenge” at home to attempt to eliminate all processed food and this cookbook, “Well Fed”, would help with coming up with some new options. I prefer the hardcover, but ok with the kindle version as well. I’m not sure if this is open to Canadians, but I’d love to try Lucy’s Ginger Snaps. Ginger Snaps are a favourite of mine, and it’s nice to find brands that make some I can actually eat. I DO bake, but as I live alone, I don’t do it too often, especially when it comes to things like cookies that are easy to eat too many by oneself. I would like anything you would like to give me. Our family is new to the gluten free world so any advice/freebies would be greatly appreciated. Thank you!! Any of the prizes would be awesome!! Living with celiac is a big learning curve!! I would love Lucy’s cookies. I have tried the Chocolate chip and Ginger. Really think the maple ones sound awesome. Would love to win the hardcover cookbook. Being new to gluten free/paleo a cookbook would be helpful. I enjoy all the recipes online but there’s something about looking in a cookbook that I just love! I would love a Klip it! My daughter is a toddler and I end up sending a million tiny containers of fruit, veggies, leftovers, etc. and this would make a lot more sense. Would love to win the cookbook! We are gluten free and dairy free and are trying to be healthier in our food choices. I would love a copy of your cookbook, I have been GF for awhile now but never make anything fun because it all seems so complicated and overwhelming. Gosh! 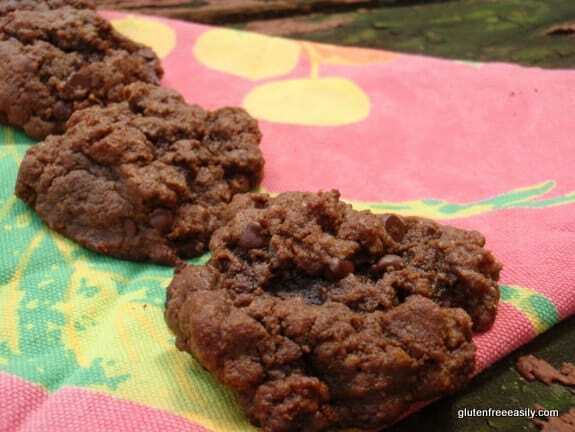 The Lucy Cookies would be wonderful as my daughter and her family eat gluten free! I would enjoy the cookbook Well Fed as I enjoy cooking healthy meals. The lunch box sounds pretty neat as for my favorite lunch bag special? Hmmm. Usually leftover dinner, cheese slices on zucchini, a salad. Today’s salad was leftover French Bistro without the poached egg on top. Thanks for the opportunity! I have a Kindle, though in cookbooks I do like hardcover. Either would work though! My goodness, the choice is hard but I’d have to say I’d love the cookbook. My husband and I are gluten free, and I love cook books and trying new ideas. I don’t have a Kindle, so would need the hard back book; however, all of the prizes look great! I would love, love, love the lunchbox and cookbook!!!! I pack lunch for my 5 year old & husband everyday and cook breakfast and dinner everyday for my family too!!! I would love, love, love the lunchbox and cookbook!!! I pack lunch for my 5 yr old and husband everyday as well as cook breakfast and dinner for us!!! All Great prizes! Wonderful story. With 2 ceoliac children it’s alsways interesting trying to fill their lunch box with healthy food they enjoy to eat. Love hearing about Sunnys stories of her family. Such a positive to know we can change with just our diet. Thank you got sharing. Thank you so much for your blog! I am very recently diagnosed as gluten and wheat intolerant. I have Lupus and this felt like one more blow! I have been gluten free for 2 weeks now and still struggle to learn. I would love to try Lucy’s cookies, I’m really missing comfort foods! Your blog has been my lifeline right now, thank you so much! Hi Shirley! The Well Fed Cookbook sounds really good and prefer a hard copy still over the Kindle version. I guess I’m old-fashioned in that respect until I get a tablet & can have everything organized, I guess. Lucy’s cookies don’t sound too bad, either! 🙂 Thanks for all you do! I would love to win any of these prizes. My 13 year old is gluten intolerant and I’m always looking for great tasting alternatives for the things she loved before her diagnosis as well as good GF recipes. I have never tried Lucy’s cookies, but my fave cookie flavor is sugar or choc chip! I would love the Well Fed Paleo book in physical book form, this book looks like it would have many recipes to fit my special allergen-free diet! Fave lunch: grilled cheese! I would love to win Lucy’s Cookies! The Maple Bliss sounds amazing, already say that Ginger Snap is the best I’ve had… G-f or not. Would love to win the lunch box. I have been unable to find one that fits my needs, but this seems to be the one! The Oatmeal cookies look great if I must choose only one :). My 11 yr old is learning her way through her disease which requires A very strict diet. So she’d love to have the hard copy of The Well Fed cookbook. Looks amazing. The Klip lunchbox would be great for her to pack herbals she makes for herself. She must have her food with her 100% of the time and this would be fun for her. Thank you for all the wonderful opportunities. , Info, insight etc. Now she’s off to check if the I gradients in the squash cupcakes are ok for her to have. I have one brave, strong, courageous kid!!! Thank you for sharing your story! My 9 year old daughter and myself are both dealing with Lyme Disease which has caused several autoimmune problems. We do gluten free and I try to stay more Paleo. Both of us feel so much better eating this way. While any of the prizes would be amazing, I love cook books. I am not a great cook but have allergies to gluten, dairy, soy, tomato, pineapple, strawberry, kiwi, nuts and coconut. My 3 year old daughter is the same, plus she is sugar sensitive. This makes meals a challenge and we are always looking for new ideas. The cookbook in hardback would be wonderful to help get me baking and cooking my own gf stuff, helping to stop relying on prepackaged stuff. 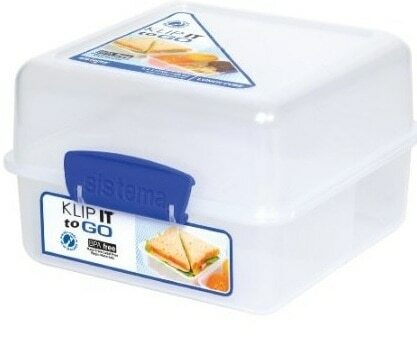 The lunch box would make packing my own stuff easier and safer away from non gf items in my home. The Well Fed Cookbook would be a winner in my house. I love cooking, getting my kids involved, and along the way teaching them about nutrition. I can not do gluten and my daughter can not have dairy or soy, so I pretty much make everything from scratch. I’m always looking for new gluten free recipes and anything that has dairy in it can be easily modified. I would love a copy of the Well Fed book. In a family of 6, we have 2 on gluten-free/low sugar diets, 1 on low dairy/low sugar and 2 which can’t stand all these “restrictions”!! Husband just eats whatever is put in front of him!! I never imagined we would be one of “those” families but we are! I need all the help I can get!! I have recently learned that I cannot eat gluten-containing foods. It is challenging to learn a new way to eat, but I am beginning to feel alive again! Please enter me in all 3 drawings. I have not tried any varieties of the cookies yet. I would probably prefer chocolate. I also prefer cookbooks in hard copy, but the Kindle version would work as well. Thanks! The cookbook would be a wonderful tool in my newly diagnosed house! I would love to get the book Well Fed! I am very interested in learning more about this lifestyle change!!! My daughter has to eat Gluten Free but I feel like we all could be more healthy! Hi Shirley! I would love the Well Fed Paleo cookbook on kindle. I have been GF for the past 4 years. I suspect that I have another food allergy or sensitivity, but I haven’t quite figured it out. I have been dabbling with Paleo eating to reduce my exposure to GMOs, and other potential food irritants. How would I start up a support group in a small community? 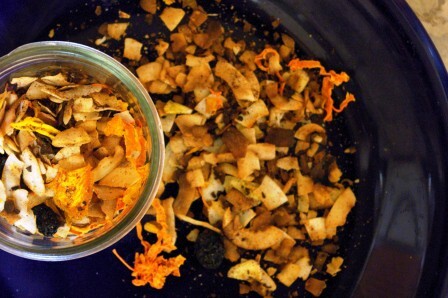 c.farley–Carrie of Ginger Lemon Girl did a post on this topic a while back. I contributed my thoughts to her write-up. I think you will find that post, which you can find here, very helpful. Feel free to email meif you have more specific questions, of course. 🙂 It’s awesome that you want to start one. We need more gluten-free support groups for sure! Thank you so much! I cannot wait to try the Lucy’s cookies. I truly appreciate all you do for us! I am so excited!!! I won a copy of Well Fed. Can’t wait to try the recipes and incorporate healthier meals into our lives. THANK YOU!! I am so excited!!!! I won a Systemica lunch box. My daughter will be so excited to use it!!! I’m excited to read your book Well Fed, I have been eating GF but could use more ideas. Thanks so much for picking me! I’m so excited to win the gf lunchbox. I never win anything so it was extra exciting. :). Thanks so much. Thanks so much for the lunchbox! It’s fun to win something!! 🙂 And thanks for your great posts and the recipes you share. I always enjoy them. You’re welcome, Stephanie! Your lunchbox got shipped out today. 🙂 Thanks so much for all your kind words! Love this site! It’s info has helped me transition into the Gluten Free World more easily. Can’t wait to try out these products!